4.6 out of 5 based on 44 bloggers and 10 commenters. 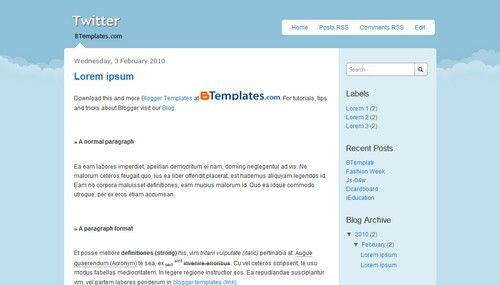 Twitter is a free blogger template adapted from WordPress with 2 columns, right sidebar, rounded corners and social bookmarking icons. es lo que muchos twitteros esperabamos…esta genial!!!! As soon as I changed my template to this one, my blog got flagged as “possible spam” and now it’s locked for review. Thanks a lot. Your trouble is not due to the template change. Sometimes Blogger flags a blog as “possible spam” by accident. Ask for a blog revision. They should remove that undesirable flag in few hours. All Users: A few days ago, most of the new templates had this problem that the Page Navigation disappeared from the templates at my blog and the Older and Newer posts page numbers disappeared. I’m deeply sorry for this problem and I apologize for a very late reply. I am very sorry for the problem. Files in Google Code hosting was deleted by someone..
no hay otras plantillas mas actualizadas?